I walked in to a record store last night to buy Radiohead's latest, Hail to the Thief. I walked out not only with that album, but with Dr. Lonnie Smith's Boogaloo to Beck as well as True Love Waits, Christopher O'Riley's album of Radiohead for solo piano. Apparently, I am the sucker for buying weird albums, like a solo piano arrangements of Radiohead songs and funky jazz organ covers of Beck songs. Fortunately, Smith's album is actually a lot of fun. I saw Dr. Smith play in James Carter's band at Iridium earlier this year and appreciated his playing. 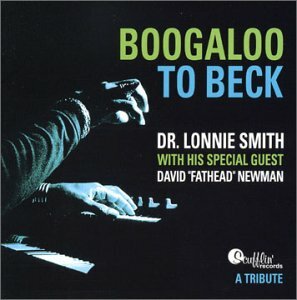 On Boogaloo to Beck, venerable saxophonist David "Fathead" Newman joins for a series of fun covers of Beck songs. The result is fresh and funky. Beck's songs groove and stripping them down to their purest melodic elements brings out the best in the songs as compositions. Even without Beck's lyrics and "everything plus the kitchen sink" sonic influences, the songs provide a solid foundation for improvisation. Smith's quartet shakes out some good and funky improvisations from songs like Devil's Haircut, Sexx Laws and Where It's At. Whereas Smith strips away much from Beck's songs to build up a different style on the same foundation, O'Reilly's arrangements of Radiohead's songs serve to accentuate the core elements of the songs. Instead of taking the same material in a new direction, O'Reilly attempts to capture the purest ideas of the songs. These two albums represent two similar, yet divergent approaches towards exploring rock music in different genres. The jazz approach feels fresher, more innovative and ultimately is more fun, while the classical approach is more ethereal. This difference in feel reflects not only on the genres used, but on the songwriters. Although both Beck and Radiohead freely incorporate electronics and weird sounds, Beck is a much looser performer intent on having fun with his music, while Radiohead strive for a more meticulous, perfectionist result. Both of these albums provide interesting listening and contrast in how to approach the essence of a song. Although Smith's work is fresher and looser than O'Riley's, neither of these discs deserve to be regarded in the same respect as Other Galactic Funk.